Am 6. Dezember findet an der ZHdK (Pfingstweidstrasse 1, Zürich) ein Symposium unter dem Titel “Memories – Pedagogies – Digital Translations” statt. Das Symposium ist eine Kooperation von HSLU-D&K Master Fine Arts „Master Dialogue“ und der ZHdK MA Art Education. Networking the Histories of Performance Art is an international network that brings together scholars and artists who research into the emergence of performance and action art in some of the lesser theorized, off-centre scenes and contexts in Europe – from Wales to Israel, Portugal to Poland – with the purpose to explore parallels and differences, influences and legacies, and to share approaches to uncovering, understanding and reanimating these histories. 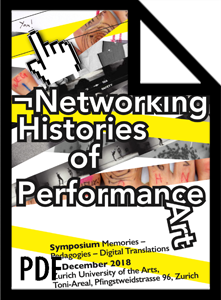 The symposium will reflect on trans/local projects of collective research, methodologies and new forms of memorizing performance art, including issues of digital translations in both processes of production and reception. A key focus will be on the relationship between performance art and pedagogy and on its documentation and mediation from past to present. This roundtable will consider the pedagogical and institutional histories of performance art in different geographic and cultural contexts. Discussions will focus on the role of the art school in the emergence of performance art practices; the development of performative pedagogies; the impact of teachers; alternative educational models and projects; and intergenerational exchanges. The roundtable will also examine possible approaches to researching and reactivating the pedagogical histories of performance art. with Jürgen Enge; Tabea Lurk; Muda Mathis (“digitale See” PANCH); Tancredi Gusman; Dror Harari; chair: Heinrich Lüber. Digitization has opened up new dimensions to questions of archiving and disseminating performance art projects. This is also evident in educational institutions – art students are being encouraged to exchange and archive their attempts to research and experiments and place them on standardized online platforms. On the other hand, online archives hold the promise of all-embracing information and endless availability. Which structural frameworks, forces and power relations come into effect with digitization? How do the different actors in the field of art (art-educators, performance artists, curators, critics) respond to digitization in their specific contexts? How does digitization contribute to the production and circulation of ‘poor images’ (Hito Steyerl) of performance art? with: Amy Bryzgel; Andrea Euringer-Bátorová; Andrej Mircev; Berenika Szymanski-Düll; Sibylle Omlin; Heike Roms; chair: Sabine Gebhardt Fink. 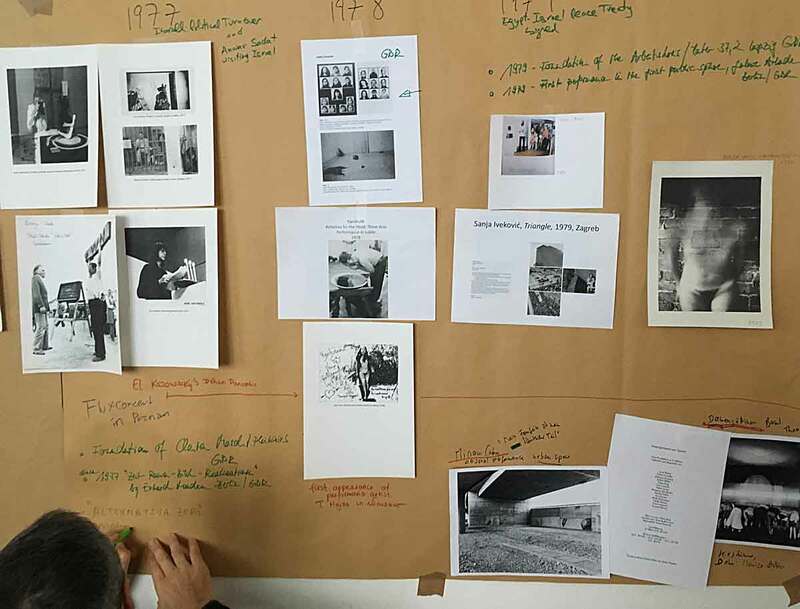 This roundtable will focus on the different strategies of memorizing ephemeral events in the field of performance art – assuming that documents and mediatisation are a crucial part of performance since its beginnings. Especially collective, collaborative and experimental strategies of recording and exchange will be of our interest. We will look at diverse research and/ or curatorial projects and their methodologies of historization as well as their re-constructions of performance art. Furthermore, the permanent “loss” addressed by feminist critique and queer strategies will be a topic.